Draw two points on the drawing pad using the ‘New Point’ tool. Join the two point using the ‘Line through two points’ tool. This line is our directrix. Take another point not lying on the line. This new point is our focus. 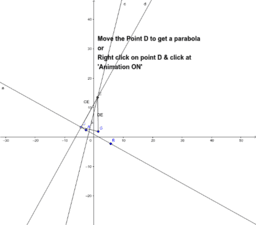 Take a point, say C on the directrix using the ‘New Point’ tool. Notice that this point will move only on the directrix. Draw a line perpendicular to the directrix, passing through the point C, using the ‘Perpendicular line’ tool. Join C on the directrix and the focus. Use the ‘Perpendicular bisector’ tool and find the perpendicular bisector of this line segment. Use the ‘Intersect two objects’ tool and find the intersection of the perpendicular bisector and the perpendicular line passing through C. Say E. Here we have made a isosceles triangle CDE, where CD and DE are equally. Right click of this intersection point, and put the trace on. Move the point C on the directrix and see that the point D is tracing a parabola.